On Friday morning, I will be flying to Korea to meet my birth family for the first time. The past few months since finding them has been (still is) an emotional roller coaster. One thing I’ve found to help keep my anxiety in check is to cook myself Korean food, such as Kimchi Jjigae. Somehow I feel closer to my native culture, as if with each bowl of soup or rice, I become less of a stranger to the motherland. My kimchi jjigae technique has been developed through a series of trials and errors (emphasis on errors). For example, the most recent batch was far from perfect– I forgot to put the green onions in the fridge when I got home, so two days later they were dried out and unusable. Ingredients and directions adapted loosely from sites such as Maangchi and food.com, with the measurements adjusted to my personal taste. 1. Prepare rice to eat with the kimchi jigae. If you don’t have a rice cooker, put your laptop down and run to the nearest Asian market and buy one!! Come back, and continue. Cover your rice with water, let set for a a few minutes– sift it around to rinse and pour rice water into a container for later use. At some point in time, I found a tip for making doenjang jigae with rice water as the soup base and the idea stuck with me. Adds a nice heartiness to the stew, I think. 2. Marinate pork in rice wine and sprinkle some black pepper on it. 3. 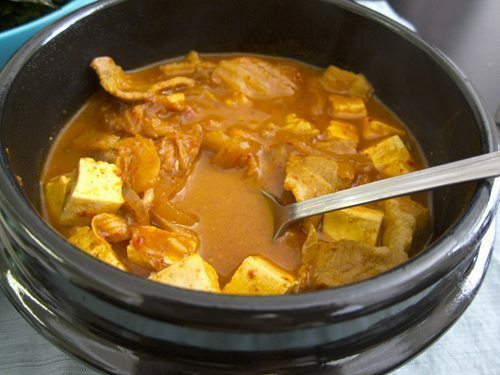 Cut kimchi into bite sized pieces, pour into a shallow pot or dutch oven along with kimchi juice from the jar. Slice up an onion and toss into the pot with the kimchi. 4. Cook kimchi and onions on medium for five minutes. 5. While the veggies are cooking, prepare your red pepper base in a small mixing bowl (will be less clumpy when you mix into the pot). Stir together gochujang, gochugaru, sesame oil, sugar and soy sauce. 6. Add pork and soup base to the pot. 7. Pour enough rice water into pot so that vegetables and pork are covered. 8. Bring the ingredients to a boil, then cover and cook on high for 10 minutes. Reduce stove to medium and cook for another 15 minutes. 9. Cut small pieces of tofu and dice green onions (hypothetically, if you didn’t leave them unrefrigerated for two days like I did). Add to pot and cook for another 5 minutes. Such a great walkthrough and the end result looks absolutely delicious, I have to give this a try and see what the hubby thinks! thanks so much!! i hope you and your hubby enjoy it!! !